The following testimony was delivered by Adrian Martinez at the California Public Utilities Commission’s public hearing in Los Angeles to consider T-Mobile’s plan to merge with Sprint, on January 16th. Read our press release to learn more. My name is Adrian Martinez and I am a Membership Organizer with the Center for Media Justice. We are a national organizing and advocacy hub fighting for the rights of poor people and people of color in the digital age, and we believe the right to communicate belongs to everyone. I am here today to share my comments in opposition of the proposed T-Mobile /Sprint merger. 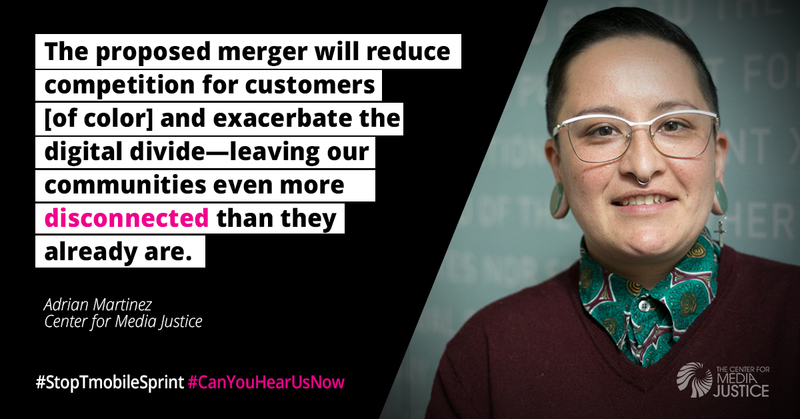 I am a T-Mobile customer, and am concerned about the impacts that this merger will have on poor people, communities of color, workers, and rural communities. There are four major wireless providers: AT&T, Verizon, Sprint and T-Mobile. Their combined customer base covers over 95% of wireless subscribers in the United States. I’m here to share the three reasons I believe this merger should not be approved. First, prices for cell phone users will go up. Competition and choice have lowered prices in the mobile market and have helped close the digital divide in mobile internet and cell phone adoption. AT&T and Verizon each control about one third of the mobile market. These carriers have found that ignoring the connectivity needs of low-income customers is good for their bottom line. That competition, however, has pushed T-Mobile and Sprint to compete for those customers. Both of these carriers also compete in the mobile resale market. Mobile resellers buy access from the big carriers and resell that access in the pre-paid cell market. These pre-paid brands, like Boost and Metro PCS are owned by T-Mobile and Sprint. Boost and Metro PCS are vital to ensuring affordable access to the mobile internet especially since many of these plans don’t require credit checks to purchase them. These two mobile giants want to merge in order to compete with AT&T and Verizon at the expense of their low-income customers. Second, this merger will primarily affect people of color. Fifty-six percent of T-Mobile’s customers are people of color, as are close to half of Sprint’s, and they are disproportionately living on low incomes. The CPUC reported in March 2017 that an estimated 2 million Californians utilize LifeLine federal benefits and T-Mobiles needs to hold their promise to continue and even expand LifeLine discounted services. The proposed merger will reduce competition for these customers and exacerbate the digital divide—leaving our communities even more disconnected than they already are. Third, Free Press reports that the merger would impact workers leading to more than 28,000 job losses across the country. Mobile internet and cell phone connections are critical in this digital age as they connect us to our families, keep us connected to work, health care, education, and other resources. I use my phone every single day to connect. I have an invisible disability and rely on my cell phone to keep me safe. In case of a medical emergency, my phone can alert my medical health team and share my location with loved ones within seconds. My family and so many other families cannot afford for our bills to go up or for data connections to change. People in the U.S. already pay the most in the world for wireless data plans. As an advocate for racial and economic justice, I understand that phones can be a mechanism for change through social media, mobile internet connection, and it gives the ability to connect to organizers and advocates across time zones. As Center for Media Justice Executive Director Malkia Cyril says, “Our voices online can help save our voices offline”. Center for Media Justice alongside our partners at CWA, Free Press, The Utility Reform Network, Media Alliance, and elsewhere say no to this merger and demand that the CPUC intervene on behalf of our communities statewide. Sign the petition to stop the T-Mobile/Sprint merger here.